How to make a pair of gemstone earrings! Easy instructions for making a pair of beautiful earrings from jewelry parts. The image above shows two of our favorite sets of earrings made using earring findings. The earrings on the left are made out of dyed howlite and the earrings on the right are made out of carnelian. Polished stones come in thousands of shapes and sizes, so why not make yourself or someone you love a pair of beautiful polished stone earrings? Making them is a very easy craft project. Make a set of earrings to match every outfit you have to ensure you never feel like your jewelry doesn't match your outfit as well as you would like. When making polished stone earrings there are four features of the stone that you will need to consider. First, you will pick a size of stone that will be comfortable to wear (many people use our small stones for making earrings). Second, you will sort the stones by color, accumulating a selection of stones that will go well with one of your outfits or stones that are so beautiful that you want to show them off to the world! Third, you will need stones that have a flat back that can easily be glued to an earring post. The final step can be challenging - finding a pair of stones that match nicely in shape, color and size. Once you have matched pairs of stones it is time to prepare them for gluing. To make polished stone earrings you will be gluing stone and earring post to one another so it is necessary to rough up both surfaces because jewelry glue does not adhere well to smooth surfaces. Using a piece of sand paper lightly sand the area of the stone that will be touching the earring. Also sand the earring pad because you will be putting epoxy on it as well. Now that the surfaces have been roughed up you need to clean both the stone and earring. Cleaning will remove any sanding residual left on the pieces as well as remove any oily fingerprints. If the sanding residual and oily fingerprints are not cleaned off than the glue may not adhere properly allowing the stones to pop off of the earring more easily. 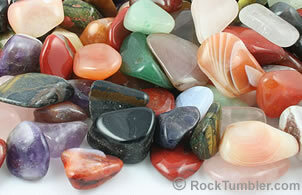 Two-part epoxy is often used to affix tumbled stones to jewelry findings. 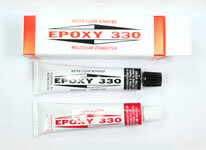 We use Epoxy 330 but there are many other types of adhesives that will work well (we review several types of glue here). 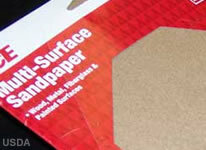 Begin by placing one drop of Part-A, the resin, and one drop of Part-B, the hardener, next to each other on a piece of cardboard. Using a toothpick, thoroughly mix the two parts together. The epoxy takes about fifteen minutes to set and about two hours to fully harden. This is where the recommended clay comes in handy. Press a stone down into the clay so the sanded section is facing up and is level. Using the toothpick put a thin coat of the thoroughly mixed epoxy on the stone where you sanded it and put a thin coat of the epoxy on an earring pad. Now place the earring post on the stone and let the epoxy harden. If the stone was placed in the clay properly the post should stay in the proper position. If the post starts to slide off you may need to hold it in place for a few minutes until the epoxy starts to set. Once the epoxy starts to set you should be able to let go of the earring post and have it stay in place for the rest of the epoxy hardening time. That's it! You now have a beautiful set of polished stone earrings to wear or give away as a gift. If you made the earrings for yourself it's time to put them on and show them off. Remember, if you made many different sets of earrings than you can wear a pair with any outfit you decide to wear. If the earrings were made as a gift then wrap them up and put a smile on someones face. It is a good idea to include the name of the stones in the card or on a piece of paper with in the package so the recipient will be able to tell people what they are. Images, text and code on this website are property of RockTumbler.com. Use without permission is prohibited.